I’m going to write more about contemplative photography and unravelling what it means. How it can enrich your life and your creative practice, no matter what that is. How it can help to infuse more soul into your work. How it can help to develop your visual sensibilities and enhance the quality of what you do. Its just like any other contemplative practice, a very personal experience. But the inklings I am following for 2015 suggest that my own developing practice might be something worth sharing. I’d love to know if there are questions you would ask about either improving your photography or about a contemplative approach to photography? Just leave a comment with your thoughts or questions and it will help me greatly in knowing where to begin with this…..or even if to begin! Light is everything, and I once spent a full year studying nothing else. It is a wonderful starting point for observation; for seeing everything with new eyes. These rare icy mornings can be overcast and misty. 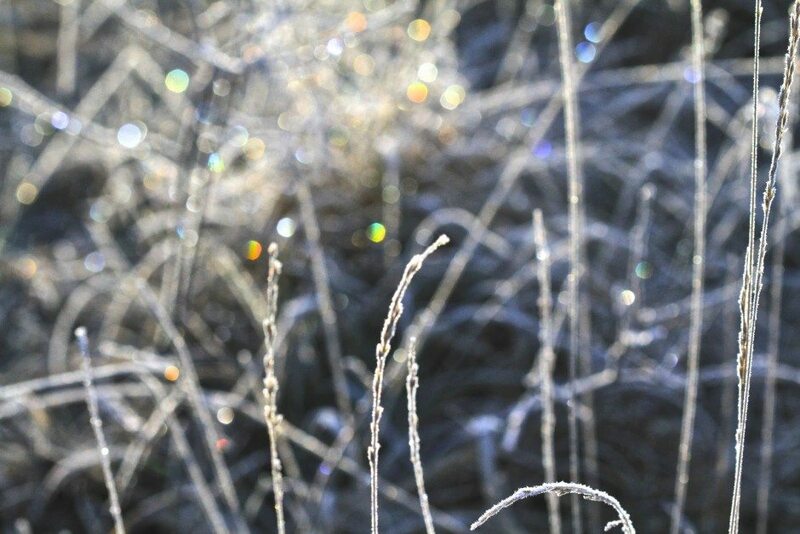 But sometimes there is a delicious combination of ice and sunlight which creates little rainbow coloured bubbles. 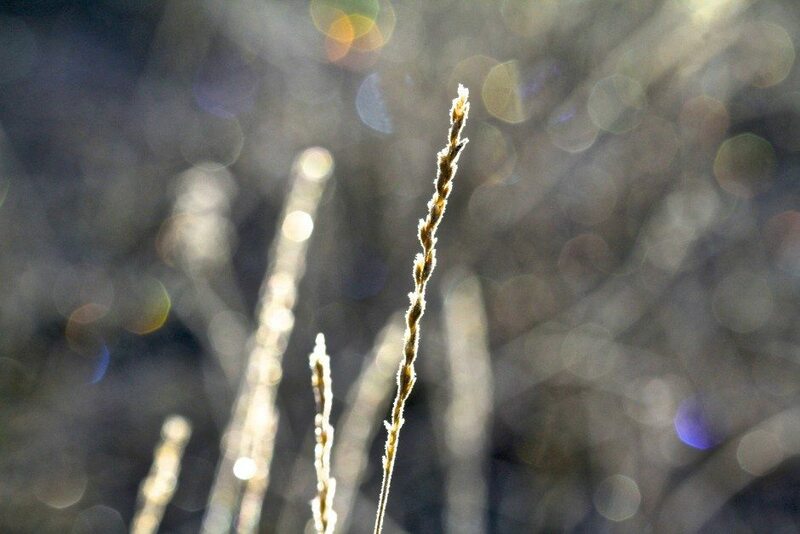 Known in photography as bokeh, it’s from a Japanese word meaning blur or haze. 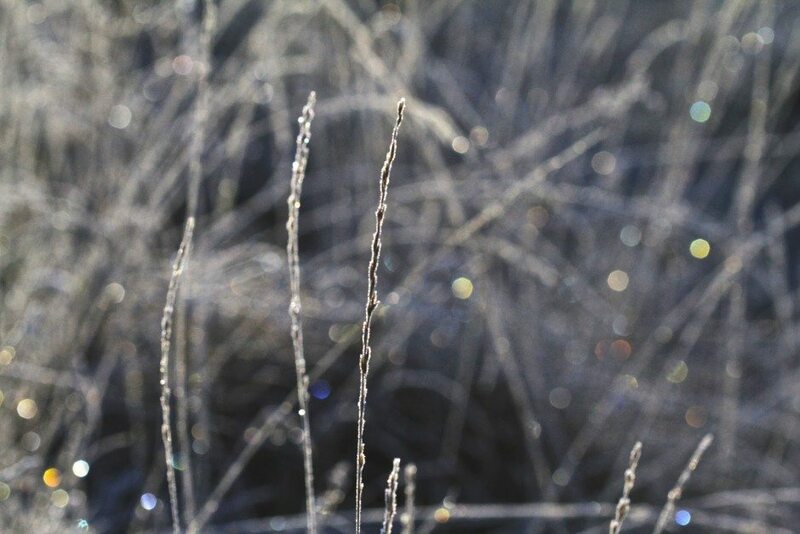 Today it’s like the morning sun just spread handfuls of silvery bokeh glitter on everything….. These photos were taken at ground level with a fully open aperture and very particular conditions that don’t happen around here too often. 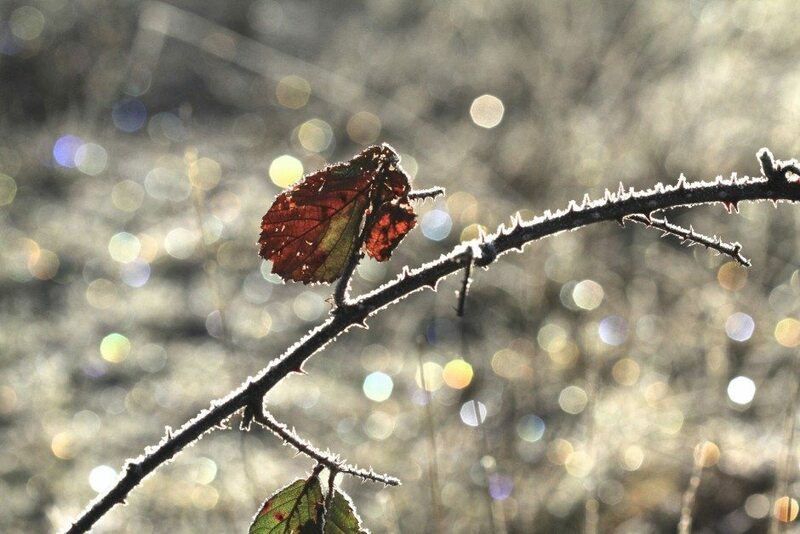 That moment when the ice softens and the moisture picks up the light just enough to shine. If you are interested in beginning a photography practice then start by studying light. Where the sun rises and sets. How subjects alter at different times of the day. The way the seasons influence the shadow falls on the landscape. How light falling softly on a child’s face creates a special radiance. I remember some of your studying of light….it was inspirational as are these ciy pics. Daily I look outside and inside at what inspires me, where the light might be shining and showing something special….I have noted that the seasonal light is so different in winter and I love trying to capture it. I would love to know how you view contemplative photography and what inspires you Catherine. Thanks Donna! The thing is that for me it's easier to do than write about! And I think your question about what is inspiring is a really great one, that and looking out the window to see where the light might be shining…I do that too!! 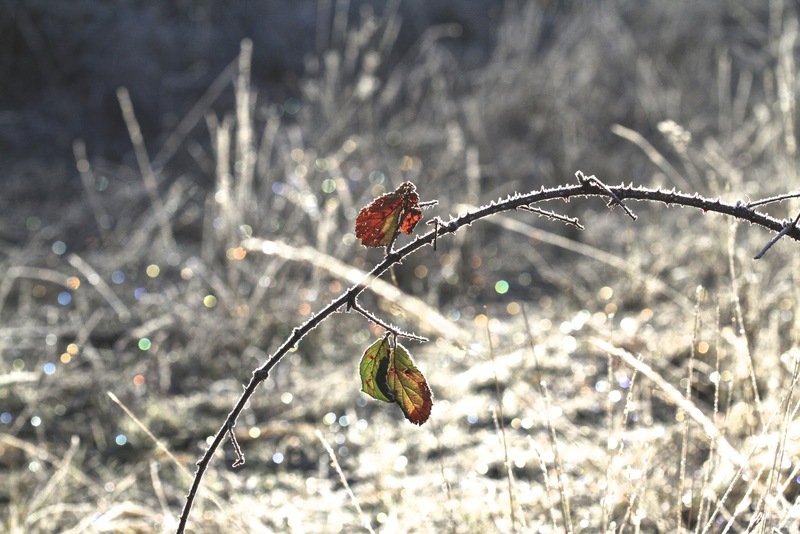 at ground level as the ice softens – that sounds like true dedication to your art. These photos are magical Catherine, like twinkling stardust. I can see what you mean about light being everything. I am particularly interested in improving the technical (boring!) side of my photography – mainly because it goes in one ear and out the other, so I end up using "intelligent auto" and crossing my fingers! I am lapping up the information in this post, and look forward to learning more. O that's great Jane, thanks for the nice feedback. The technical side used to bother me too. I think practice is the best antidote and the more you do it the better you will get. I always found that for women the language and logic of cameras are all wrong. I'm all for automatic settings, camera phones, point and shoot, for me it's more about the joy and fun of it rather than aiming for technical perfection. Will do my best to keep giving insights and inklings then! I do contemplative writing, but had not thought of doing contemplative photography. I love this idea! And maybe I do some of this already, without realizing it, when I am struck by the light on a newly-opened poppy in our spring garden or the way the sun slants through the patio doors in the afternoon. My photography skills are basic (I use a Nikon D5100) and I would be interested in tips to improve as well as exploring the contemplation of light. Thank you! Fabulous images my dear! Can't wait to see more! I have memories of working alongside my husband in the southwestern part of the U.S., which is Navajo and Hopi country and also the home of the ancient Anasazi in their cliff dwellings. My husband would wait with incredible patience until the light would move across the light of the canyon wall in just the right way. Often we would wait hours. Then we would come back in the morning to view the same wall. It was an education. For young photographers, Paddy would say, film and now digital! is cheap–just keep taking pictures and more pictures. I learned a great deal about dedication to art. About your Bokeh, there is also the expression "God Rays" when the light from the sky seems to come right down from heaven in glorious rays, but there is no other light source around. Hi Susie, I think your husband knew a lot about that light…..the difference it makes to how we see everything. We are so lucky with digital to be able to experiment as much as we want. I remember the misery of counting out my black and white film, one shot at a time and the fear of "wasting" one! Yes God Rays or Holy God as we used to say…….gotta love em!!!! I am so pleased to discover your site! I share your passion for contemplative photography and a life understood one photograph at a time! 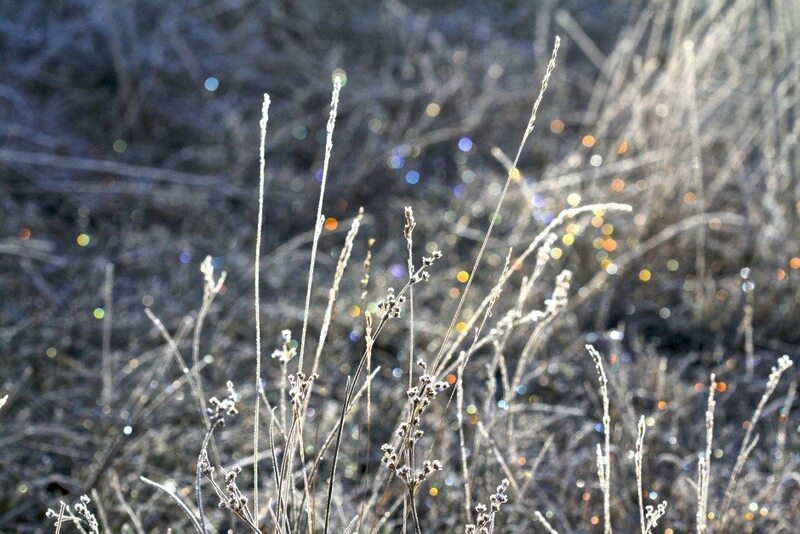 Sparkling light ! And the air becomes crystal !